More students in Hounslow who took on the new tougher A-levels achieved above the London and national average. The percentage of A-levels in Hounslow at A*-A was up 2.1 percentage points to 23.2% in 2017, compared to 21.1% last year. This year’s provisional figures show that Hounslow’s overall pass rate at 98.4% was above the London (97.6%) and national (97.9%). 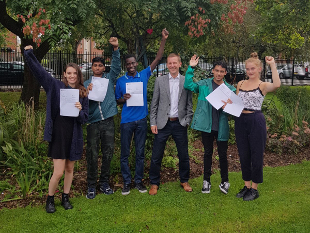 Councillor Tom Bruce, Cabinet Member for Education and Children’s Services, Hounslow Council, said: “I would like to congratulate each and every one of our students for achieving their results which means Hounslow as a borough continues to improve at the highest level. “A lot of hard work goes into achieving these results, not only from the students themselves, but from the schools, teachers, governors, parents and families who offer that vital support throughout what is often a stressful time. “As a Council, we are committed to providing the best opportunities for our young people in our borough, which includes providing high quality education in our schools. For those students having got their results, but are unsure about what to do next, the Hounslow 14-19 Connexions Team are available to provide free impartial advice and guidance on the range of options available. On Friday 25 August, from 2pm-4pm, the service is hosting a special ‘What Next after GCSE or A levels’ event. There will be an opportunity to access impartial advice and guidance, plus meet local colleges and training providers.